I believe he’s related to the Crash Dummies. An action figure. Man , Biff is an awesome name for an action figure. Why not just use an IV? That’s what all the normal coffee junkies do. He might want to use a funnel, for faster pouring…? Notice how the coffee isn’t quite pouring into the neck-slot-thing. Burns are the number one risk of drinking coffee without your head on. “NEW BIFF ACTION FIGURE, FROM MATTEL! Biff is definitely related to crash test dummies. I wish I could do that… Except it would have to be on Mondays. Fridays I can get through. Mondays, not so much. 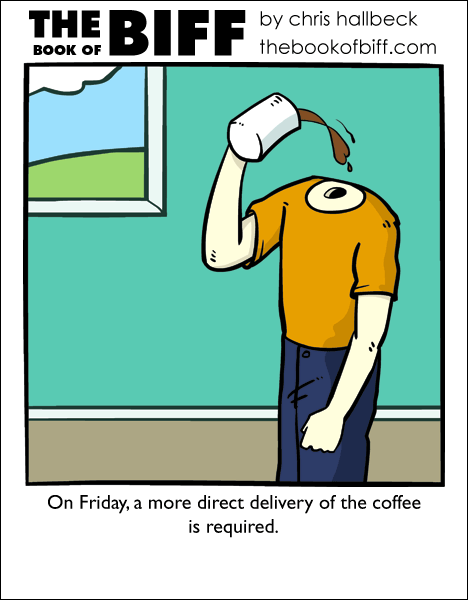 An even faster way would be to position the coffee maker so it pours it directly into his neck, no coffee pot necessary. The screw-off head is sold with replacements. Since no one is saying anything about them the action figure would need to hammer shaped matches…. The action figure would also be covered in lead paint after being made in China. Or it would be proudly made in America…by robots. I knew it! He’s Hollow! I think he may be some sort of crash test dummy crossed with roach genes…. That’s exactly how I feel, but on mondays. I guess his head went to play with his brain. Those eyebrows must be prehensile. Biff`s mom was a Crash Test Dummy his dad was a human who had his DNA spliced with play-doh and his grandfather lived underwater before deciding to go to the surface. Marthion, I can’t say “Friggit” for 2 weeks now! He got dandruff again. It’s particularly bad on Fridays. I just do like Dave Letterman and set up a Jolt Cola IV right into my veins. This makes sense now! Biff is the cousin of Buster from Mythbusters!!! Who whants to make an biff action figure!